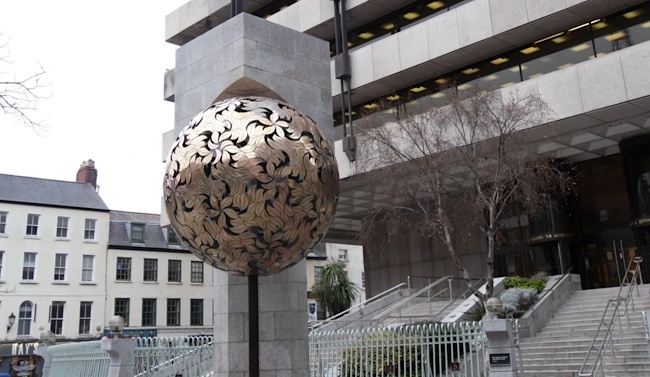 The Central Bank of Ireland has officially begun its participation in the country’s new centennial program highlighting the anniversary of the Easter Rising, which took place on Easter Monday, 1916, and led to the creation of the Irish Free State, known today as the Republic of Ireland. 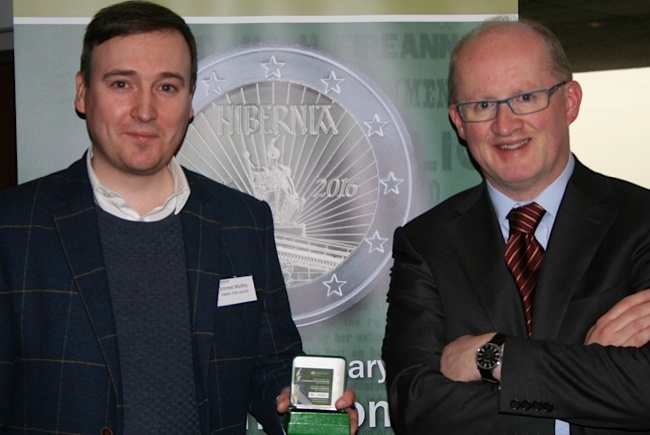 The launch was especially significant as the event was hosted by the Central Bank’s new Governor Philip Lane, who took the opportunity to highlight the Bank’s first stand-alone commemorative €2 coin. 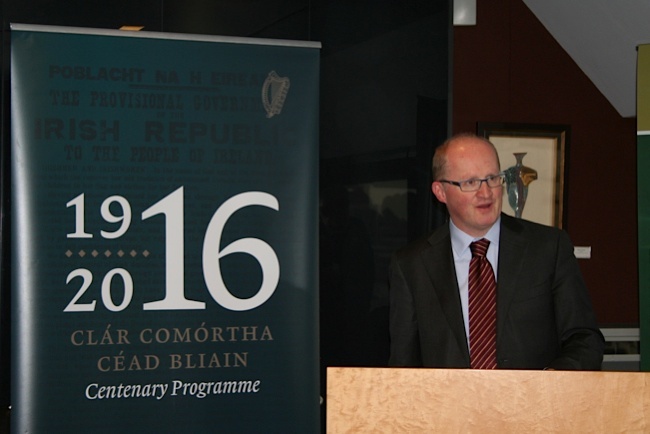 He also noted that the Central Bank of Ireland’s participation in the centennial program was organized by a joint government, private initiative. For 2016, the program will promote events and those personalities who played an important role in the eventual emergence of the Free State in 1921. The launch took place at the Bank’s Central headquarters on Dame Street, Dublin, from the Building’s Liffey Room, so named for its view of the River Liffey. The proceedings commenced with the Governor Lane taking his place at the podium, greeting invited guests who assembled to take part in the launch of Ireland’s first-ever commemorative €2 coin and see the new issue for the first time as a finished product. This was Mr. Lane’s first collector coin launch himself since being appointed Governor late last year. He praised the Bank’s collector coin department for their work to bring the product to markets, especially noting the design competition launched early early 2015. The winning design was chosen from a submission by veteran CBI artist Emmet Mullins, whose earlier designs included the re-issued and updated “Barnyard” series of silver crowns. Mr. Lane also thanked the Bank’s coin advisory committee, whose task it is to recommend suitable and historically relevant designs for the Bank’s collector coin program. Aside from highlighting the country’s new centennial anniversary program initiative, the occasion was also taken to present the first strike of the Proof examples to Emmet as the designer. With the proceedings concluded, invited guests were given the opportunity to purchase both the Proof and BU quality €2 piece a day before the official sale date. 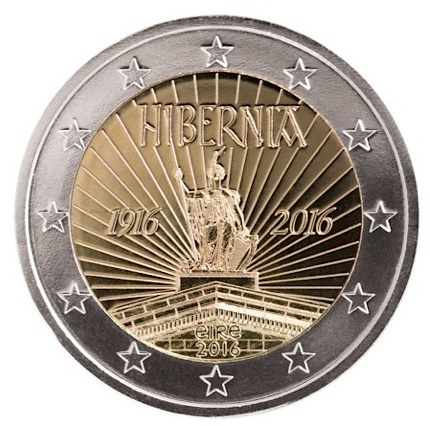 Ireland’s first own €2 commemorative coin pays tribute to the centennial anniversary of the Easter Rising. The event occurred when Padriag Pearse (1879 – 1916), one of the founding fathers of Ireland’s independence movement, read out a proclamation on the steps of the General Post office on Easter Monday in 1916. The proclamation called for an immediate end to British rule of Ireland and for recognition of the hastily formed provisional government. Pearse was executed less than one month after reading the independence proclamation along with fourteen other signatories and followers of the movement. He was honored by the Irish government in 1966 on the 50th anniversary of the event, when his likeness was included on a ten shilling silver coin. The new coin has a total mintage of 4.5 million pieces and is expected to be seen in circulation within a matter of weeks of its official January 20 issue date. Its design includes a depiction of the allegorical figure “Hibernia,” whose statue can be seen on the very top point of the General Post Office. The line of commemorative products includes the Proof version of the €2 coin, a BU version packaged in both a coin-card folder and a practical bookmark, and the annual Mint set. 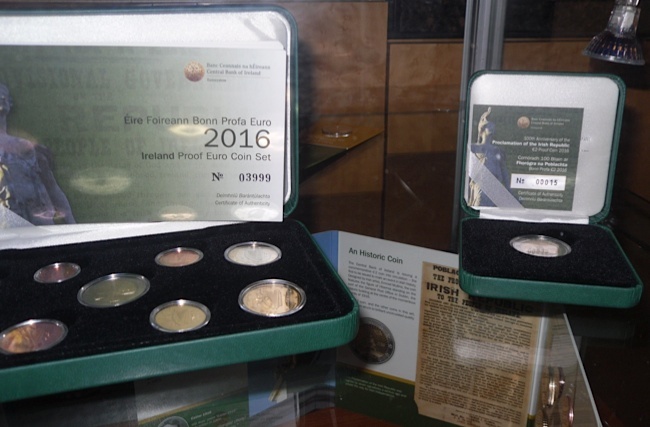 The Proof €2 is also included in the 2016 Irish Proof set, which includes all eight coin denominations. The €2 single Proof coin is packaged in a green presentation box and the collector coins division has confirmed that with 20,000 examples, it has been over-subscribed. Interested collectors can enquire by visiting the Bank’s Web site or by visiting the cashier’s office in the lobby of the Central Bank’s headquarters during office hours.